This makes a full meal for 2 people. Some notes: I used Lundberg brand rice in this recipe but any brown rice would work. Also you can substitute the rosemary for thyme if that’s what you have on hand. Make the rice. As rice cooks, preheat the oven to 400 F. Lightly oil and baking sheet or lay down some tinfoil. Wash the squash and then slice in half. Spoon out the seeds. Use about 1 tablespoon of the oil to rub on the squash and then place them cut side down on the baking sheet. Bake uncovered for about 30 minutes. While the squash cooks, sauté the leeks and garlic in the remaining oil until the leek is translucent. Add the bell peppers and rosemary and continue to cook for about 5 minutes more. Add the mushrooms and sauté until the mushrooms are just tender and release their water. Remove from heat. Mix together rice and vegetable sauté. When the squash is finished baking remove from oven and turn cut side up. Mash the flesh slightly (working carefully!) and then stuff with rice mixture. You can use all of the rice mixture here or you can save some for a side dish. 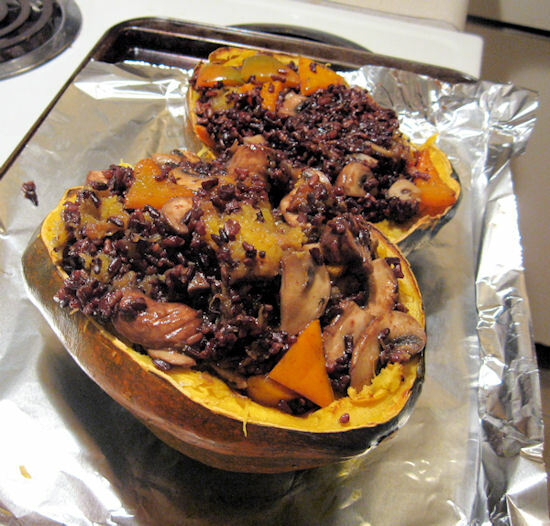 Return the stuffed squash to the oven and bake for another 25 minutes. Sprinkle cheese on top and enjoy! This recipe originally appeared in Food for thought : a cookbook for the Canadian library community.